Tunisia's basketball team, African champions, defeated DR Congo's 73-49 at a friendly game played Wednesday in Goulette. 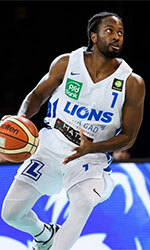 The game is part of the national team's warmup for the FIBA World Cup 2019 African qualifiers (Group A) second tournament that will take place in Rades from June 29 to July 1 with the participation of Guinea, Mali and Chad. The national team will also play the International Tournament of the City of Tunis from June 14 to 22 in Goulette and Rades. Tunisia will face RD Congo on Thursday before taking on the United Arab Emirates on June 17 in Rades (1700) and Mali, on Monday June 18 in the same venue (1200). In the first tournament of the World Cup African qualifiers played last February in Yaounde, Tunisia won their two matches over Mali 101-40 and Cameroon 67-66.